* Chloride - 5E15Aa, 5E15Bf, 5E15Bk, 5E15Bl, 6600004, 8600004, 8600016, B200X7, C102, CA, CE15AA, CE15BF, CE15BK, CE15BL, KB1, PSM9. * Dual Lite - 26117, 262, 2678, 3901, 3921, 5298P, 6117, 6D3W, 8301, CA. * Emergi-Lite - 6KSM6, 6LSM3, 6LSM4, 6LSM5, 6LSM6, 6M3, 6M4, 6M5, 6M6, 6MB, 6TSM3, 6TSM4, 80019, JSM27, JSM272, JSM42, KSM272, LSM542, M3, M3019, M3G, M4. * Technacell - SLA12170, SLA12180. * Light Alarms - 100-001-0073, 1PG2X5E, 2RPG3, 4RPG2, 4RPG3, 5E15AC, 5E15BB, 5EI5BR, 605P1, 6RPG3, DM6, DS6, E8, PL1, XS, 12-535, 1PGX5, 1PGX5E, 26-01, 26-04, 26-45, 2PG1/L9MHV, 2RCI, 4520608, 4520610, 476778, 5E15BR, 6M2, 8600010, CE1-5AL, CE15BQ, CE1-5BQ, E1, ED, EL, EL0607, ELB0606, ELB0607, ELBO608, ELT16, EP650, EP660, EP66026, EP66036, EP665, EP66526, EP66536, EP666, EP670, EP680, ES, ESESPEL, FL, LCR6V6.5P1, LLBE1, PB28D, PL2, PL3, TC670, UH24. * Lithonia - PGPA, X78, EXP36, F12G1, FG1, P12G1, PG2, PGX5, PS10MP, RPG1, RPG1H, RPG2, RPG2H, S12E3, SL050, TBRC1, TBRC2, TBRC3, X79, X79BRA2L. * Silent Knight - N5HR. * SureLite - 4140XMP, 4140XMPT, 5140XM, PE612, PE6512, PE712, PWPS1270, RB12V6, RBAT6, 00, 00RE, 1, 12621, 12-621, 250, 4120EC, 626, 6712, 899953, 8XJBRA, C18A6, DL712V, EP1250, EP1260, EP126026, POWER 30. * APC - Back-UPS 200 BK200, Back-UPS 200 BK200B, SMART-UPS 200 AP200, SMART-UPS 200 200DL. * SL Waber - 420MT, POWERHOUSE 420T, UPSTART. * EATON / POWERWARE - 3110-300. * ELGAR / AMETEK - IPS400, IPS600. * Chloride - 1000010045, 100-001-0145, 9F4Y, QT6. * Emergi-Lite - 6KSM6, 6LSM3, 6LSM4, 6LSM5, 6LSM6, 6M3, 6M4, 6M5, 6M6, 6MB, 6TSM3, 6TSM4, M3, 12M15, 80000, BSMX14R, CSM1, L3, M1, 2.4e+009, 6JSM1, 80017, QSM1, SMX. * Light Alarms - E1, FL, 2RC1, CE15AA, CE15BN, CE15BS, CE15BF, CE15BK, CE15BL, SGLD. * Lithonia - AP, AS, ELB0604, ELSQ, EMB1060601, EMBOPS6401, FAP, FAS, LLBE2, Q4, XP, XSXPEL, 303S13, 6ELM2, ELCC, ELCC T, EMB0PS6401. * Dual-Lite - CLA106, S-18-186. * Eagle Picher - CF6V4, CF6V4.5, CF6VS6, CFM6V4.6, CFM6V4.6S6. * Exide - S300, SSG, M84001A5060042S, Q5, Q6, S200. * National Power - GS012P2, GS012P1, GS012P3LL, GSO12P3. * Siltron - EM-401, SQE8, 80, EM40L, SN640, SQE6, WXET. * Douglas Guardian - DG6-4. * Elan - EPX, EP2X, MB6V. * Mule - 6GC012D, 6GC012E, 730001, EP, GC640, GC640 EXIT, GC640EXIT, 6Gc0121, Bkm2, PE46. * Prescolite - E820060800, EM EXITS, EX3 EXITS, E56060, E82080800, EM Exit, EMEXEDM, ERB0604, R86VDC4AH, RB, RB6V4, RB6VDC4AH. * Carpenter Watchman - 713527, CLA106. * High Lites - 3901, 3921, TES. * Holophane - M2, M3. 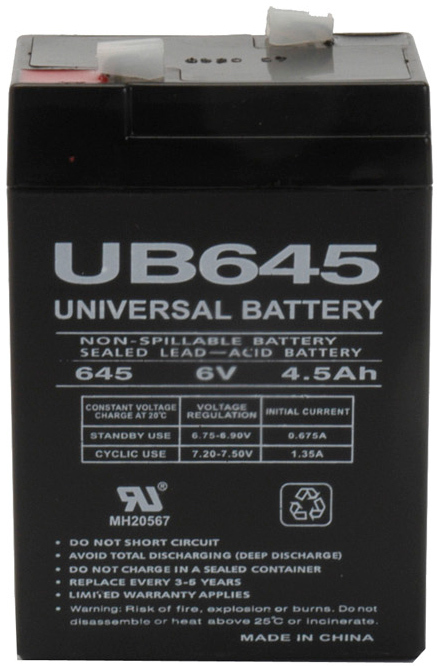 * Interstate Battery - PC640RF. * Radiant - SN48T, SN640. * Sentry Lite - SCR52520, 640. * Teledyne - BIG BEAM S65. 4.18" x 2.78" x 1.88"